Nagasaki Must be the Last Place to Experience an Atomic Bomb. August 9th, 1945 11:02am. Following Hiroshima, the second atomic bomb in the world destroyed the city of Nagasaki and many people became victims. We must never forget this day and we must make Nagasaki the last place to experience an atomic bomb. This wall clock was found in a house near the Sanno Shrine in Sakamoto-machi, which is around 800m southeast of the hypocenter. Despite sustaining tremendous damage in the blast, the barely surviving clock face shows 11:02, the moment the atomic bomb exploded. Nagasaki opened its historical curtain in 1571 when Portuguese ships arrived. It was the only window open to the world through The Netherlands and China during the national isolation period in the Edo era. Many talented people visited Nagasaki in search of the latest information from abroad. At the end of the Edo era, the government opened the ports of the country, western style buildings were built in the city and foreign settlement trading prospered in Nagasaki. 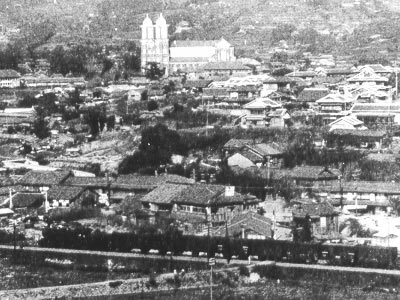 With the modernization from the Meiji period and beyond, Nagasaki went from being a city of trade to a city of shipbuilding. During the Japan-China War and World War II, it strengthened its wartime appearance. On August 9th, 1945, a summer day arrived in Nagasaki, the hilly city surrounded by mount ains on three sides, which had engraved its own history since the opening of its ports. The weather was fine at 11:02am on Thursday August 9th, 1945. This is the sky above the tennis courts at 171 Matsuyama-machi in Nagasaki City. The pluto nium type atomic bomb was dropped from a height of 9,000m by the American bomber, Bockscar. It exploded approximately 500m above the ground. The enormous energy of the explosion sucked up matter from the earth, and propelled it into the air. 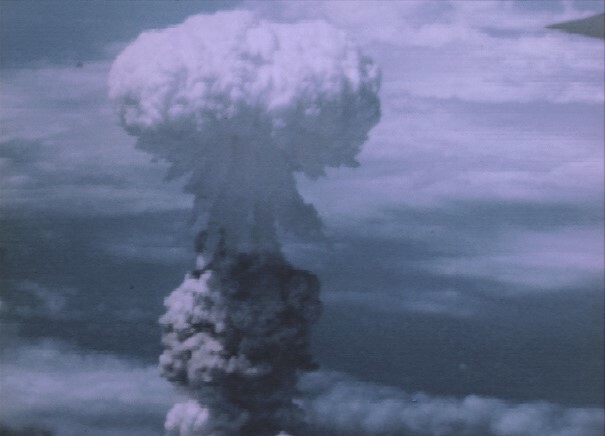 This became a mushroom cloud, which was constantly evolving in color and shape as it steadily rose, until it reached a height of 9,000m roughly 8.5 minutes later.